British Petroleum, more commonly known as BP, was created in 1908 after George Reynolds discovered a well of oil in the Persian Sands. Since the formation of the company BP has become a market leader in the oil industry and today, BP is an international company, operating in over 70 countries. BP produces 3.6 million barrels per day of oil equivalent. It operates in all areas of the gas and oil industry, meaning that like Shell, it has total control over its supply chain. BP has been supplying the UK with petrol for over 100 years and contributes £8.76 billion to the UK GDP yearly. They operate multiple rigs in the North Sea, mining the UK’s oil fields and are investing billions of pounds in the future of the North Sea. BP Ultimate Unleaded has a research octane level (RON) of 97, with its standard unleaded petrol having a RON of 95. They also provide a premium diesel called BP Ultimate Active, and a super unleaded with the same name. This Active additive is designed to enhance the performance of the car by cleaning the engine, which in turn increases overall performance. 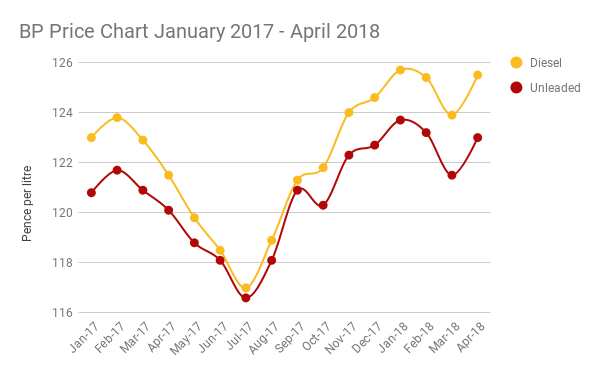 When it comes to EV charging, BP are later to the market than most, having only announced plans to start in January 2018, with roll-out starting since February/March 2018. BP revealed the full extent of their charging plans at the end of June 2018, purchasing ChargeMaster the UK’s largest charging company combining the current network of over 6,500 points with BPs 1,200 forecourts. BP also showed how they were going to bring fast charging to the next level, building points that can charge an EV 100 miles in 10 minutes. This is the fastest on the market, proving BPs promise to create environmentally friendly spaces.